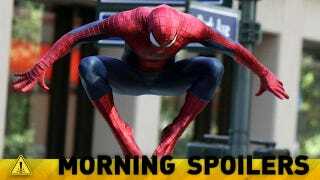 Brand New Hints for Avatar 2, Avengers 2 and Amazing Spider-Man 3! There's another crazy Star Wars casting rumor, involving Dame Judi Dench! Could Mary Jane be recast for Amazing Spider-Man 3? NBC's added major castmembers to its Rosemary's Baby series and greenlit a Oz-based show. Plus, the executive producers preview Once Upon a Time's return. Spoilers now! I don't know anything, but seeing as how they picked up the next two Divergent films, I don't know how I would keep my sanity with two big action films in one year. I would say that it's better, it's cooler, it's more awesomer. It's a little bit darker, but also really has Joss Whedon's incredible witty and sly sense of humor. I went down to the studio that they've been setting up for the past three years. It was wonderful. Jim took us and gave us a tour of all the reference pictures, telling us the stories. I haven't been able to read the scripts. They're still working on them. We kind of get choked up. [Cameron] gets emotional telling us about the story. I get emotional hearing about it, so I'm looking forward to it. Kitsis: We set something up for a reason. We're really going to explore what that meant and what happens when these two people meet. We're going to see what happens when Regina has a second chance at love. Horowitz: We have a whole bunch of fun people popping up, but it's in service of focusing on the core group of characters and the problem that you saw outlined in the winter finale. Kitsis: We're still going to get to see Tink (Rose McIver) again and Ariel (JoAnna Garcia Swisher) and some of the people we met in the first half of the season as well. Lumiere (Henri Lubatti) is one of our favorite characters. He's really fun and interesting. Horowitz: It's a slightly different take than what you might expect from the movie. Alas, Jerry Orbach is not with us so we couldn't bring him aboard to do it, but we have a take on the character that we think is fun. It's fun to see him interact with Belle (Emilie de Ravin). Kitsis: With Rapunzel (Alexandra Metz), it's princes and damsels in towers. In Emma's current mind. the last time she saw Neal, that guy f—-ing let her go to jail. She doesn't have the benefit of re-meeting him in New York. There's plenty of story we have in mind for Belle, that we hope the audience likes. Emilie [de Ravin] is fantastic, doing some of her best work that we've ever seen. Are you kidding me? I think it would be really disappointing to leave the audience with this giant question mark. I would go back in a heartbeat.
. . . I am committed to [Believe], but I don't think that door is shut. So I am hoping there is something we could do to answer those questions. It's a sense of camaraderie. She had gone on this journey and she's forever been searching for Princess Aurora and finally they find Aurora and she's left out in the cold. And then Phillip disappears and it;s her journey with Aurora finding Philip. So I think she's been able to develop a really deep relationship with both characters and I think ultimately her heart was with Aurora. They're handling it as you expect them to. Sam kind of goes introverted and Dean goes forward. Sam is more the kind of guy that thinks something out and says, 'Well, you know, this is where you messed up [and] this is why I'm upset. '… It's nice dichotomy to catch on camera and, hopefully, Jensen [Ackles] and I get a chance to do a good job with it. I bit her for reasons that, you know, you will find out as the season progresses. They were good reasons and I have good intentions. One of my favorite scenes is the scene that actually takes us to the moment where Elena is bitten into the pack and the circumstances that led to it. The performances are just fantastic and that whole episode. And it features some of the best and most effective CGI shots we've built. And you get to really see Clay in his full wolf form. And it's just beautiful.